The Qualified Default Investment Alternative (QDIA) regulations created fiduciary protections for plan sponsors and enabled them to create better retirement solutions for their participants. In order for your organization to meet your fiduciary obligations to prudently select and monitor your target date QDIA funds, a thorough analysis is necessary because of the underlying complexity of these products and their unique structure relative to the traditional “core” investment options that defined contribution plan sponsors are used to evaluate. Target date funds are designed to be a single investment option that is appropriate from the time an investor enters the workforce and starts saving for retirement all the way up to, and in some cases, through their retirement. Because of the expected longevity of these investment vehicles and the expectation that plan sponsors do not want to shift target date fund series every few years to chase better products, it is important that the investment management firm be fully committed to their product. Commitment to the target date fund series shows up in the form of dedicated investment professionals focusing on managing the target date funds, fully developed research supporting their construction methodology, and a minimum level of asset scale within the products. Ultimately, your evaluation of the investment management firm comes down to the people, processes, philosophy and performance. Supporting the five P’s should be sound investment and operational processes that allow the investment professionals to meet the funds’ investment objectives while ensuring compliance with all applicable rules and regulations. Our process combines the five P’s and the QDIA regulations into a plan sponsor questionnaire and a demographic analysis of the participant population for an approach that is tailored to the organization with the final result being an investment opportunity that fits the plan demographics, complies with the DOL guidelines, and most importantly positions plan participants for successful outcomes. Copyright 2015 Bedellium, Inc. All rights reserved. 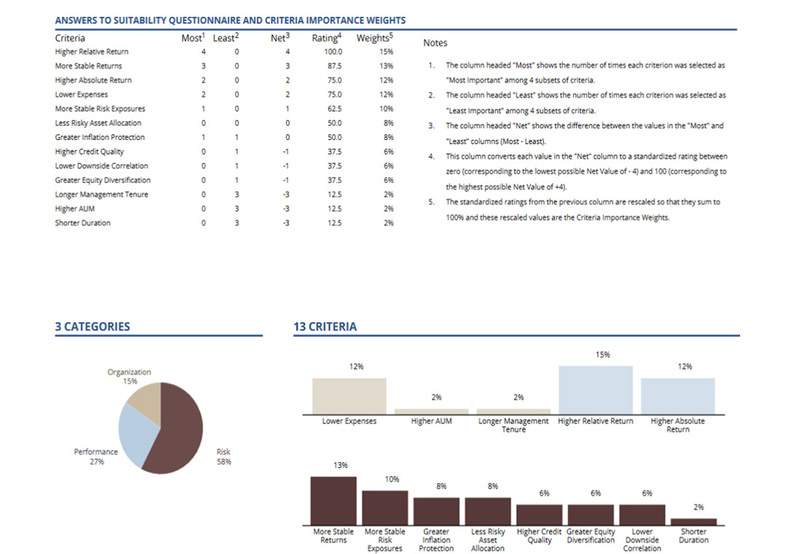 Where the Blue Book optimizes a committee’s opinion, Risklab’s Glidepath Optimizer optimizes a plan’s demographics and risk tolerance as exhibited by the Participant’s investment behaviors.